At Thorns Collegiate Academy we’re always looking for ways to extend our students’ learning. As a result, and as part of our school improvement programme, we are now using CENTURY – a ground-breaking online learning platform. CENTURY provides our students with access to a variety of high-quality learning materials and assessments in English, mathematics and the sciences. CENTURY makes personalised learning recommendations based on students’ strengths and areas for improvement, so that our students always know the best topics to study next. CENTURY supports our students and staff by personalising learning and assisting staff with planning, marking and monitoring progress. Students are able to access the service at anytime and anywhere. It is available to them in school and also at home. All they need to do is visit the CENTURY Tech website and enter their unique login details. Their login details will have been given to them by their teacher. One of the many benefits of CENTURY, is the Guardian Portal feature. 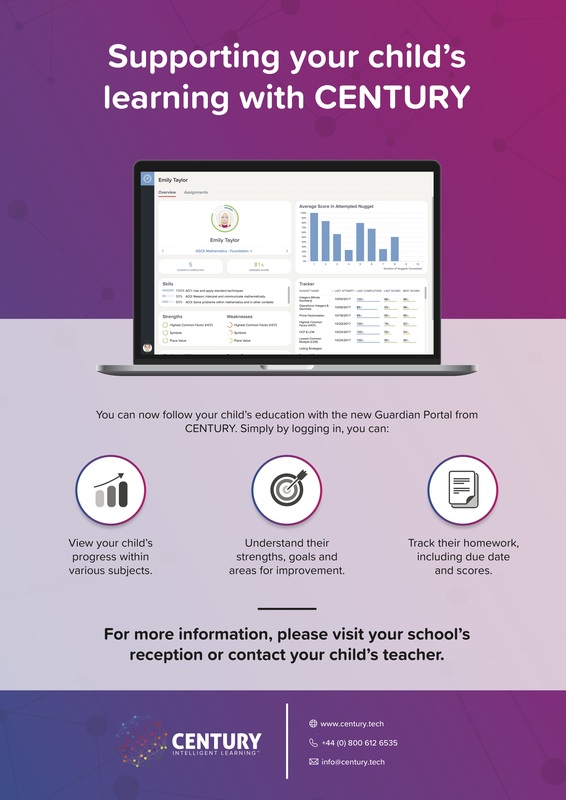 The portal provides parents and guardians access into CENTURY, so you can see what homework your child has been set, when it’s due and how they’ve performed. To sign up, please speak with your child’s form teacher, and they’ll be able take the next steps to provide you access.